You are curenlty in Fortis Entrust™ One-Piece Drainable Ostomy Pouch, Pre-Cut 3/4", Standard Wear, 12", With Fortaguard, Transparent made by Fortis Medical Products and asigned to category. The Fortis Entrust™ One-Piece Ostomy Systems Feature A Skin Friendly, Standard Wear Adhesive That Is Strong, Yet Gentle To Even The Most Sensitive Skin. A Tape Collar Adds Extra Security. Flat And Flexible To Adhere Easily To The Body Contours. Lightweight To Minimize Drag Associated With Fullness. Soft Mesh-Like Back Panel For Comfort And To Help Reduce Skin Irritation Even In Warm Weather. Film Designed To Be Quiet And Discreet. Transparent For Ease Of Viewing Output And Stoma. Large, Easy To See Cutting Guide For Customizing The Opening To Fit Perfectly. 12" Pouch With Tail Clip. You have selected Fortis Entrust™ One-Piece Drainable Ostomy Pouch, Pre-Cut 3/4", Standard Wear, 12", With Fortaguard, Transparent from Ostomy Supplies. We hope that this Fortis Entrust™ One-Piece Drainable Ostomy Pouch, Pre-Cut 3/4", Standard Wear, 12", With Fortaguard, Transparent made by Fortis Medical Products is what you were looking for. If you have any questions about this particular Fortis Entrust™ One-Piece Drainable Ostomy Pouch, Pre-Cut 3/4", Standard Wear, 12", With Fortaguard, Transparent or any other products from Ostomy Supplies, please call us. We have an experienced staff that will gladly help pick out the correct Fortis Entrust™ One-Piece Drainable Ostomy Pouch, Pre-Cut 3/4", Standard Wear, 12", With Fortaguard, Transparent for you, also. 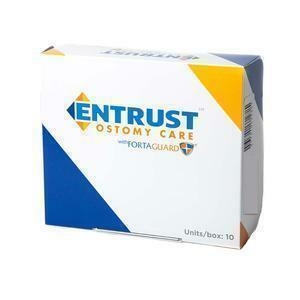 If you are looking to make a purchase of Fortis Entrust™ One-Piece Drainable Ostomy Pouch, Pre-Cut 3/4", Standard Wear, 12", With Fortaguard, Transparent in large quantity or you are a Hospital or Medical facility and need help on making a purchase of Fortis Entrust™ One-Piece Drainable Ostomy Pouch, Pre-Cut 3/4", Standard Wear, 12", With Fortaguard, Transparent made by Fortis Medical Products, please contact us.